Russian President Vladimir Putin said Tuesday "a chain of tragic circumstances" is responsible for a Syrian missile attack that caused a Russian military reconnaissance plane to crash in the Mediterranean Sea late Monday. Putin's comments came several hours after Russia's defense ministry said "hostile" actions by Israeli fighter jet pilots led to Syrian air defense systems shooting down the plane. Putin did not criticize Israel but said he supported his defense ministry's statement. FILE - A photo taken on July 23, 2006 shows an Russian IL-20M (Ilyushin 20m) plane landing at an unknown location. 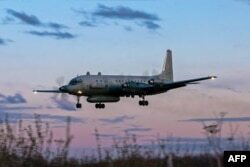 Russia blamed Israel on Sept. 18, 2018 for the loss of a military IL-20M jet to Syrian fire, which killed all 15 servicemen on board. Putin promised to increase security for Russian troops in Syria, saying Russia will take "steps that everyone will notice." Russian military spokesman Maj. Gen. Igor Konashenkov said Tuesday that Israeli forces were carrying out an attack in Syria's Latakia province when they hid behind the Russian plane, using it to shield themselves from Syrian missiles. Konashenkov said an S-200 missile brought down the Russian plane, killing 15 people. Israel and Russia have for several years used a special hotline to notify each other of certain military actions in the region in order to prevent clashes. But Konashenkov said Israel gave Russia only one minute of notice of its operation, leaving the Russian plane no time to get out of the area. He called Israel's actions "irresponsible" and said Russia would have an "appropriate response." Israel's military disputed Russia's accusation it used one of its planes as cover, saying the aircraft "was not within the area of the operation" when it was hit. It also said "when the Syrian army launched the missiles that hit the Russian plane, [Israeli] jets were already within Israeli airspace." The Israeli military blamed the militant Hezbollah group and and Iran for shooting down the plane and expressed sorrow for the deaths of the Russian aircrew. U.S. Secretary of State Mike Pompeo said the downing of the plane was "unfortunate" and a reminder of the "need to find permanent, peaceful, and political resolutions to the many overlapping conflicts in the region and the danger of tragic miscalculation in Syria's crowded theater of operations."